It’s been two weeks since our first guest post, in a series were we will be featuring our favourite travel bloggers, who are inspiring others to see the world. It was originally going to be a monthly thing but we just can’t wait a full month to post our next one, especially not when it is these guys! Lauren and Daz are another Scottish couple, living the dream and travelling the world together but it’s not always been plain sailing for these guys. They beat the odds and stuck out long distance for a very long time before getting to where they are today and they are nothing short of inspirational. 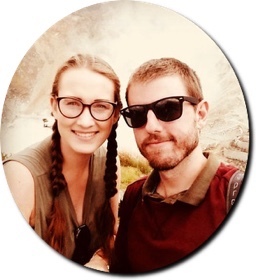 We just love reading their blog, their honest, down to earth and hysterical approach to writing had us hooked from the minute we came across these two and corresponding with them just cemented our opinion that these two are great and we hope to cross paths with them one day. Would you catch a flight to visit someone you love? Would you do it every weekend? Spend your Friday nights delayed in airports, your Sunday mornings saying goodbye? Long distance relationships are not for everyone and we are proud to say we stuck it out for 6, yes SIX years. The first four, I was at university at the bottom of Scotland and Darren in Aberdeen the very North East. Although in the same country, this meant a four hour drive after work on a Friday in order to spend two nights together. The minute I graduated I legged it to London, so cue two years of flights and Friday nights in departures. Not only was it expensive (the flights and the fact you require a mortgage for a G & T in London) but it became exhausting. Darren was an engineer in the oil industry, which wasn’t exactly booming in London and I refused to move home, so a compromise had to be made. For our New Year’s Resolution for 2017 we decided it was time to quit the day job and live the day-dream. No more flights to see each other, the next flight would be with each other. It took 6 months to raise the funds, 2 months to persuade the parents and 1 month of extensive research to book the trip of our dreams. Originally we spent 3 months in Europe and called this “the dress rehearsal.” Meaning, if backpacking life was not for us, it was a short flight home and no Visas or major money wasted. In total we spent 3 months in Europe – dancing, dining and drinking our way round 12 countries without major incident. Okay, we nearly killed each other over a rowing boat on Lake Bled and an argument so bad over Currywurst in Cologne, I threatened to get the next plane home. You can read exactly how much Backpacking Europe costs here – although please don’t judge how much we spent on wine and hummus. A major highlight of our time in Europe was our Workaway experience. We spent 3 weeks in Switzerland, with one of the kindest families we have ever met. In exchange for 3 meals a day, free accommodation and use of their car, we helped to run their luxury glamping site. They even allowed us to stay in one of their luxury tree houses! You can read all about our Quirky Accommodation experiences around the world and our tree house sleepover is a firm favourite! Following a short jaunt home to surprise our families at Christmas, we had well and truly caught the travel bug. Not quite content with knowing we’d accomplished our New Year’s resolution, we decided to head off again straight after New Year for our next Workaway, this time further afield in Hawaii. From watching the lava flow, to learning to fire dance Hawaii ticked so much off our bucketlist we still speak about it daily. The food was incredible, the beaches unforgettable and the people some of the friendliest we have ever met. We put together a Workaway Review with our top tips to find your dream host too! If you think our travels sound like pretty plain sailing so far, you might appreciate a read of our Epic Travel Fails post. Following the missile warning in Hawaii we imagined we’d had our fair share of bad luck. That was until we arrived in Fiji – in a cyclone. Despite being a tad traumatized from our Fiji experience, we continued to New Zealand for our biggest test yet. Five weeks living in a campervan. Couples who work well living apart at opposite ends of the country perhaps shouldn’t attempt 5 weeks living in a van. Or if they do, don’t choose a travel buddy as messy as Lauren and as OCD as Daz. Or who enjoy New Zealand wine as much as both of us as it may result in a very drunken attempt at a cooking show which you decide to share with the internet on Youtube. It’s a good job we chose the backpack life as our Youtube channel https://www.youtube.com/channel/UCWDEq9RHJK5saTxrEDBbzRw?view_as=subscriber) has probably made us unemployable. Or so we thought. Following van life we waved bye to our wee Cathy the campervan and arrived in Australia and for the first time in 6 months (and to our surprise) managed to got jobs. Hilariously, my boss was Scottish and following a quick whisky initiation test and Daz swapping his shorts for a shirt we were back to the 9-5. However, what was meant to be a quick fling with Melbourne turned into a full-blown love affair and we ended up staying 6 months in our jobs and loved every single minute. Melbourne is like no other city we’ve ever been to – the street art, the food scene, the people. It ticked every box. For the first time (so far) we had found a city that we agreed on. That was until we were offered by our employers to stay and to us, that sounded a little too much like commitment, so the backpacks are back on and we could not be more excited. These guys have had an amazing journey so far and we are looking forward to seeing what their next big adventure has in store for them. We are sure it will be as amusing as ever and we wish them all the luck in the world!